What Are Bay, Bow or Garden Windows? Bay windows, bow windows and garden windows are unique from other replacement windows options in that they all extend outward from the exterior wall of your home. Unlike other window styles, bay, bow or garden windows can actually transform the look and feel of your home – at a fraction of the cost of remodeling the entire room. They are available in a wide variety of styles, finishes and decorative glass options, allowing you to express your own individual taste and style. Although each of these home replacement window options offer a scenic view of an enlarged area encased in glass, they all do so a little differently. 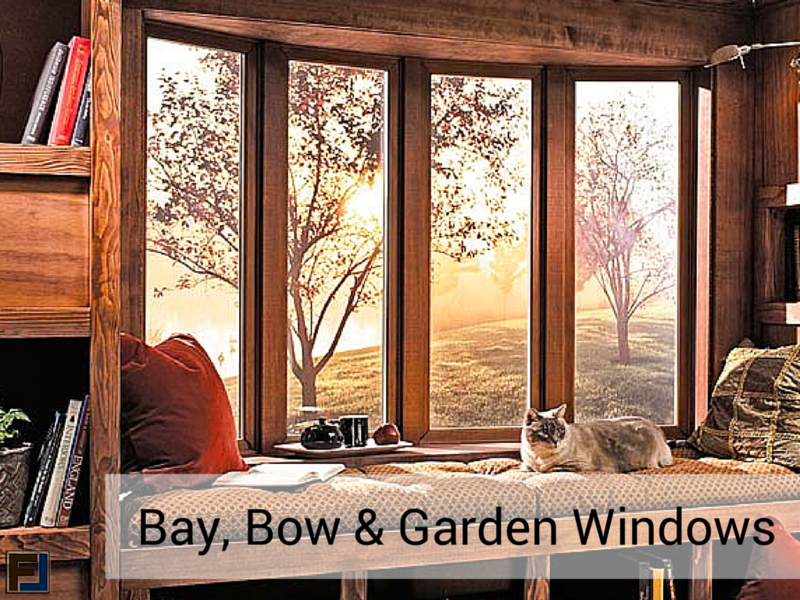 Read on to learn more about bay windows, bow windows and garden windows. Bay Windows have three openings, available in angled projections with a fixed picture window in the center and side windows that can be fixed or operating with double-hung windows or casement windows. Bay windows feature a deep inside insulated seat area that can be designed to match your home’s decor. Usually, most existing window openings can be upgraded to a bay window. 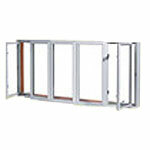 Bow windows are usually made up of four to six openings, usually of equal dimension, arranged in a gradual arc shape. 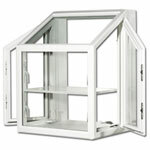 Bow windows feature a more shallow insulated seat, fixed center windows and optionally, operating casement windows on the ends (as shown above). Like bay windows, most existing window openings can be upgraded to a bow window. Garden windows, also known as ‘box’ windows, feature side panels and a back panel that are set at ninety degrees to one another and to the wall. Garden windows are typically found in kitchens as they extend out from the house. Garden windows generally have an interior shelf for plants and herbs with side vents that can provide ventilation. Why Replace Old Windows with a Bay, Bow or Garden Window? Aside from being an attractive addition to any room of your home, bay, bow and garden windows come with many features and functional benefits to enjoy. Add A Little Space – Bay windows, bow windows and garden windows all lend additional square footage to a room while creating a feeling of spaciousness. These windows also provide a stylish shelf space that can be used for growing plants or displaying your favorite décor. Energy Efficient – Heavy-duty weatherstripping and weather seals ensure that bay, bow and garden windows offer an energy-efficiency and money savings. Low e-glass can also be installed to offer year round energy efficiency. 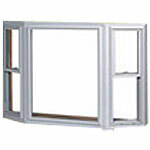 Additionally, all replacement window option are generally operable on the sides, creating excellent cross-ventilation. Increase Home Value – Since bay, bow and garden windows all add square footage to a room; they will ultimately increase your overall resale value and improve your home’s curb appeal, as well as interior, immensely. A bay, bow or garden window can be added to just about any room to bring big light into a small space. Frontline Windows & More, Inc. specializes in crafting custom bay, bow and garden windows for your home. If you have any questions about bay windows, bow windows, garden windows, replacement windows, or home windows of any kind, please contact us or visit our showroom.